Make new friends & play football with like minded people! 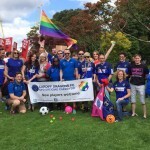 We’re here to provide a safe and comfortable environment for LGBTI+ people to enjoy football. There really is something for everyone! Just come along to training or get in touch. We know it can seem scary joining a new club but a warm welcome awaits you!